Joss Whedon must be utterly exhausted by now. After all, having spent the last five or so years behind the camera for not one but TWO of the biggest superhero movies ever made, not to mention overseeing a television series based on said films, is enough to put anybody out of commission for an indeterminate amount of time. But seeing how Avengers: Age of Ultron has turned out, as the heavily-anticipated follow-up to 2012’s record-breaking and game-changing spandex ensemble that it is, it’s safe to say he’s well and truly earned some time off. Managing to somehow be both bigger and more epic than even the first film – and don’t forget, that film ended with a thwarted alien invasion of New York City, complete with its own flying sperm whale-like creatures – Age of Ultron packs an insubordinate amount of action set-pieces that never fail to impress. Be warned, because there’s A LOT of them in this flick – it even opens right in the middle of one, as team members Iron Man, Captain America, Thor, Hulk, Black Widow and Hawkeye (played respectively by Robert Do… oh, do you even NEED to know who’s playing them by this point?!) lead an assault on a HYDRA base in the snowy forests of Eastern Europe – and it’s likely that fatigue could set in quickly for those tired of seeing explosions and the sort fly about on screen (you have Michael Bay to thank for that). Thankfully, each one of them here is more entertaining than the last, eventually leading to a spectacle of a climax that literally raises the bar. As an additional cheek reference to the endless amount of city-wide carnage that has appeared in most post-Avengers superhero movies – looking at you, Man of Steel – there is a far greater emphasis on the safety of innocent civilians, and entire scenes are dedicated to showing how they evacuate large areas so that as few people as possible are in harm’s way. Whether or not this was indeed concocted as an antithesis of Zack Snyder’s Superman reboot, which famously saw Krypton’s most famous resident destroy most of Metropolis in the climactic battle against his enemies, it’s still an oft-disregarded element of superhero movies that acts to remind that they actually have to be, well, heroes rather than just extra-powerful people. Grim though all this may sound, and with its significantly darker tone compared to what came before it’s easy to understand why people won’t find it as fun this time round, it is also surprisingly still very funny at times. Whedon has always had a knack for comedic timing amidst a film’s darker moments, and Age of Ultron is no exception – whether it’s in the middle of a tense action scene, particularly a Johannesburg showdown between an enraged Hulk and Iron Man’s “Hulkbuster” armour, or during one of the film’s many wry character interactions (which we’ll happily analyse shortly), Whedon never lets the dour tone completely dominate his film. When the time is right, there will be moments of genuine hilarity to counterbalance all the seriousness, making for a far more enjoyable experience than most will probably be expecting. Making the film truly work, perhaps more so than any Marvel film before it, is the work done on its characters. As ever, it’s great to see characters like Tony Stark, Steve Rogers, Bruce Banner et al bounce off one another with their individual egos and differing viewpoints, but there’s a far more human quality this time round which is brought about by how comfortable and interesting they are. The actors’ chemistry with each other still burns bright, which is most evident in an earlier sequence which simply sees them interacting amongst themselves or other guests at a party; it’s a lovely section of the film which makes them feel more real than the comics could ever allow. This strong passion for character remains throughout the film; as a way of making up for him mostly being a mind-controlled puppet in the first Avengers, Jeremy Renner’s Hawkeye is given a much larger role which even sees his personal life explored, while Banner’s own struggle with his identity as the unofficial mascot of the team leads to some truly touching moments with Scarlett Johansson’s Black Widow. As for the new arrivals, James Spader – as the titular AI gone rogue – is gifted as a reasonably strong adversary with a surprising sense of humour that ties neatly with his intimidating presence, and former Godzilla couple Aaron Taylor-Johnson and Elizabeth Olsen have their strong moments as a pair of twins with highly unusual powers such as super-speed and telekinesis. Elsewhere, Paul Bettany gets to finally do something other than sit in a recording booth and voice computer software J.A.R.V.I.S as the big-screen incarnation of The Vision, but to say more about him would ruin the surprises. It’s almost a shame that Whedon has elected not to return for the two-part Avengers: Infinity War sequel (Captain America: The Winter Soldier helmers Joe and Anthony Russo have stepped in to fill that gap), but with Avengers: Age of Ultron he’s redefined the superhero ensemble he helped to create while making something worthy in its own right. His work, as they say, is done (for now, anyway…). 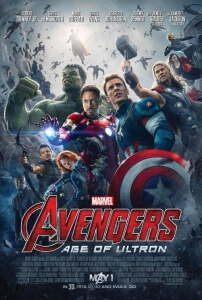 Avengers: Age of Ultron is a superhero sequel that further pushes the boundaries set by its own predecessor, mixing an overload of impressive and often hilarious action sequences with strong character work to create one of Marvel’s most well-crafted flicks in its entire filmography to date.